When it comes to holidays, there are few that pose as high of a risk to oral health as Halloween. While other holidays have their own share of desserts, Halloween is an entirely different beast; controlling candy consumption is no easy task. That’s why it’s important to establish a plan beforehand so your child doesn’t have a mouth full of cavities come the new year. Before you let your child out the door, take note of these tips from a dentist so they can keep their mouth healthy! While all candy is harmful to oral health, there are some varieties that are worse than others. For example, chocolate is actually one of the best candies you can eat because it doesn’t stay on teeth for very long, nor does it contain nearly as many of the harmful ingredients inside other common Halloween candies. Candy that is hard, sticky, sour, gummy or crunchy are the worst offenders because they tend to stay in the mouth for long periods of time and stay on teeth even after you finish eating them. It’s quite easy to find yourself snacking on sweets the closer you get to Halloween. Your child is far more likely to be exposed to candy during school for example, where snacking on candy is common. However, snacking on sweets is one of the more common ways cavities appear as it extends the amount of time the mouth is exposed to sugar. When eating Halloween candy, especially after a night of trick or treating, make sure to save it for after meals where saliva production is high. It may seem like a good idea to brush right after eating candy, but many types of candy can soften enamel after consumption. That means brushing immediately after can actually increase the risk of enamel erosion. Instead, drink water to wash off loose food debris and bacteria. Wait 20 minutes after consuming candy before you start brushing. This way, saliva will begin to remineralize enamel and strengthen it enough to be brushed without damage. 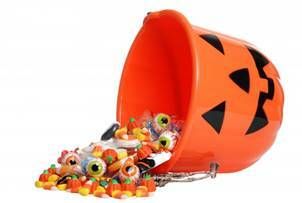 As mentioned, drinking water is a great way to rinse bacteria and food from teeth after eating candy. Of course, you should be drinking water throughout the day as well, not just during and after eating. Furthermore, those who eat out often are probably aware of how accessible soda is, especially in fast food restaurants. It is imperative that you avoid soda if you intend on eating candy throughout the month of October. Soda is one of the worst beverages you can drink for teeth, with some being worse than others. These tips are ideal for protecting teeth in between dentist visits, but you should still be scheduling yourself and your children for cleanings and exams every six months! Dr. Erick T. Anderson earned his DMD degree from the Oregon Health Sciences University. Since then, he’s devoted much of his time outside of the practice towards continuing his education and staying on the cutting edge of dentistry. He’s always learning more so he can provide the best dental advice possible. To learn more about his practice, you can contact him through his website.